Preheat grill pan or outdoor grill to high. Mix meat and next 4 ingredients. Divide meat into half and score each half into 5 pieces. Roll the meat into balls then squish it into small, thin patties, 3 inches across. You will yield 10 patties. To make a double batch or more, meat can be made into patties ahead and placed on cookie sheets to store 24 hours. These patties can also be baked on cookie sheets in preheated 400 degree F oven for 10 to 12 minutes. 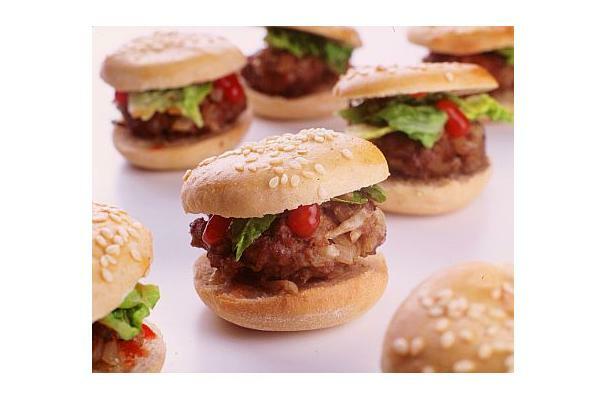 But, on a hot indoor or outdoor grill, these small burgers will take just 2 or 3 minutes on each side for medium doneness. Serve on dinner rolls with chopped lettuce, chopped onion and Special Sauce. To make sauce, combine ranch dressing with ketchup and black pepper.